An effective hair fall control combo that you will swear by, Skin Elements Hair falls control pack has products that have an amazing balancing blend of Caffeine, Almond Oil, & Argan Oil, to help give your strands the strength they need to stand their ground against daily damage and breakage. This rich, moisturising formula, infused with restorative Argan Oil, Vitamin B5, Rosemary and Lemon Oil stimulates cell renewal and healthy growth as it revitalises hair follicles and supports a healthy scalp; resulting into thicker, softer and shinier hair. Skin Elements introduces Caffeine infused shampoo. 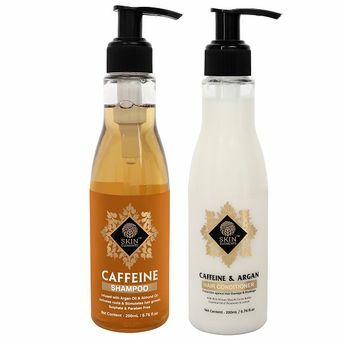 Caffeine can stimulate cellular regeneration and circulation, which can help both Skin and Hair.Good for strengthening hair follicles from inside, Skin Elements Caffeine Shampoo, works to cleanse your hair whilst awakening your senses.Sulphate free, this deep cleansing formula lifts grease and grime from your hair. With added Argan Oil, a key ingredient that restores softness, strength and gives shine to your hair and Almond Oil that controls hair loss, Skin Elements Caffeine Shampoo is the perfect solution for those who want thicker fuller and more voluminous hair. Explore the entire range of Shampoo available on Nykaa. Shop more Skin Elements products here.You can browse through the complete world of Skin Elements Shampoo .